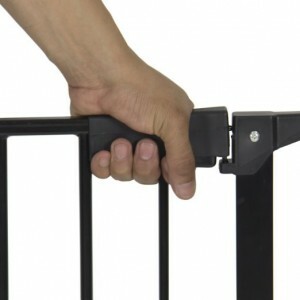 Made with heavy-duty metal, this safety gate is perfect to put around dangerous locations around the house – inside and outside – such as fireplaces, barbecue grills, stoves, balconies, swimming pools and stairways, etc. 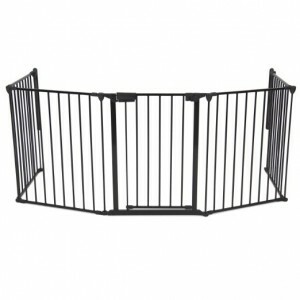 With this safety gate encircling these hazardous areas, your children will have the house to themselves to roam around freely, without feeling restricted or trapped. This is a hardware mounted gate that needs to be screwed to the wall which gives it extra sturdiness and strength. In the event of an active and strong child, the gate wouldn’t budge or fall if applied pressure to it. The Baby Safety gate can also be installed as a independent play area with the extensions that come with the single set. The play zone will give your child ample space to stay inside without the gate having to be mounted or screwed to a wall. The play area can be installed inside or outside the house, as needed. This gate extends to 122 inches and stands to a height of 30 inches. The door in one of the extensions opens to a width of 17 inches. The individual extensions are 25 inches long. Depending on the area of the location, all the extensions, or some of them, can be used. Even though the gate is metal, the fire from the fireplace or the barbecue grill does not make the gate hot and risky to the touch. The temperature of the metal bars rise slightly, but not enough to harm the baby or the pets. 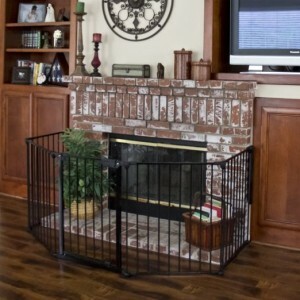 Children can enjoy the show of a good fireplace by sitting next to the gate without any chance of getting burnt or scalded. The built in door allows the grownups to enter the area encircled by the gate when they need to, but the childproof lock keeps children and pets out. The door swings both ways and has an auto lock feature that is helpful when someone is in a hurry. The instructions that come with the gate to aid with installation has been known to be inadequate, inefficient and poorly translated, making it hard to use. Also, the gate is hardware mounted, which sometimes makes it hard to attach to the walls around the fireplace, especially if the walls are marble or stone.